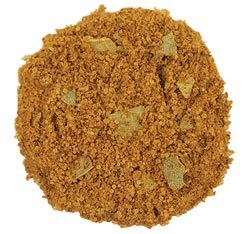 Ing: salt, mustard, red pepper, celery seed, paprika, black pepper, thyme, ginger, laurel, mace, cinnamon and spices. Seafood and seafood products represent some of the most important foods in almost all types of societies around the world. Seafood can figure into any and every meal. Two additional reasons for this burgeoning popularity are versatility and healthfulness. As a peninsula with a large coastline, the coastal regions benefir from having and excellent choice of fish. Fish can be cooked in many different styles and in every conceivable way: poached or steamed, deep fried or pan fried, baked, grilled, broiled or smoked. Fish is truly good for you, low in calories and high in protein. Easy to digest and naturally tender, fish cooks quickly no matter what method you use. Heat the oil in a large, heavy-bottom skillet. Add the onion and fry until light brown. Add the garlic paste, ginger, cumin, coriander, turmeric, chili powder and garam masala. Fry for 15 seconds, then add the fish pieces and gently stir. Add the tomatoes, salt and green chilies. Cover and gently cook for 5-10 minutes or until the fish is tender. Remove from the heat and add the chopped green and red pepper. Since frozen fish is the type most readily available, flakes easily it is a good idea to add the fish towards the end of the cooking. Alternatively the fish can be fried separately and added to the sauce or the dish can be cooked in a preheated oven at 160°C / 160° F. Cod hake, halibut, coley, haddock, plaice or whiting are all suitable for this recipe. Clean shrimps and place in a large bowl. Chop the cilantro and add to the shrimp with garlic and salt. Seed and slice the red, green and yellow bell peppers. Add the cumin seeds. Fry for 1 minute. Add green chilies. Add shrimps and stir-fry, stirring and tossing the shrimp gently for 5 minutes. Season with black pepper. Add bell peppers and cook for an additional 10 minutes. Transfer the shrimp and bell peppers to a serving dish. Garnish with a fresh cilantro and serve with rice. Place the yogurt in a large bowl. Add the garlic-ginger paste, chili powder, cumin, coriander powder, garam masala, salt and red food coloring and blend together until well mixed. Add shrimps to the yogurt - spice mixture and mix to coat well. Cover and let it marinate in refrigerator for a minimum of 6 hours. Preheat the broiler to the medium. Transfer shrimps to a heatproof dish and brush with vegetable oil. ▫ Cook under the preheated broiler for 30-35 minutes, turning the pieces occasionally and basting with any remaining oil, until the meat is tender and cooked through. Shell and devein the shrimps, then set aside until required. Chop 1 onion and grate the other one. Heat the oil in large pan. Add garam masala and cook over low heat, stirring constantly for 1 minute or until it gives of its aroma. Add the chopped onions and cook, stirring occasionally for 5 minutes or until gold. Stir in the grated onion, turmeric, cinnamon, cardamoms, chili powder, cloves, and bay leaves and cook stirring constantly for few minutes. Stir in half coconut milk, desiccated coconut and sugar and season with salt to taste. Add the shrimps and cook, stirring frequently for 7 minutes or until they change color. Stir the remaining coconut milk and bring to a boil. Serve immediately with rice, garnished with cilantro. Combine all the marinated ingredients. Pour over the fish and set aside for 1 hour. Remove the fish from the marinade and pat dry. Combine all ingredients for the batter. Coat the fish in the batter and set aside for 15 minutes. Fry in hot oil until golden brown. Serve hot. Soak the tamarind pods in a cup of hot water for 10-15 minutes and extract the pulps. Add the garlic, cumin, mustard seeds, fenugreek, coriander, turmeric, chili powder, coconut and curry leaves. Gently fry for 30 seconds. Add the tamarind pulp and the tomatoes and simmer gently for 1 minute. Add the mackerel, then the chopped chilies and salt. Cover and cook for 30-40 minutes or until the fish is tender. If necessary add a little water. Fry the chopped onion in the oil until light brown. Add the cumin seeds as soon as they begin to crackle, pour the mixture over the fish curry. Sprinkle with the chopped coriander leaves, add a piece of chili and serve with plain boiled rice. Add the onion and cook over low heat, stirring occasionally for 7 minutes, or until gold. Add the garlic-ginger paste, cumin, coriander, turmeric, chilies and pinch of salt and black pepper and cook, stirring constantly for additional 2 minutes. Add coconut milk, bring to a boil. Add the mussels, cover, and cook for 10 minutes or until the mussels have opened. Discard any mussels that remain shut. Transfer the mussels with the coconut sauce to a serving dish. Garnish with a fresh cilantro and serve immediately.